Social Media marketing, strategy and professional development blog for Jon-Stephen Stansel, a social media strategist living in Austin, Texas. I made this on Canva in less than 5 minutes…and it shows. Canva is not a replacement for a graphic designer. Not too long ago I was at a conference giving a presentation on social media in higher ed. About half an hour before speaking I added a slide my deck that while seeming innocent at the time, caused quite a stir. It was just something that had been on my mind and I didn’t realize how polarizing this slide would be. Half of my audience laughed and applauded and the other half squirmed uneasily in their seats. Tweets were sent with high five emojis. Frowns and whispers of disapproval were heard from the back of the room. The slide that started the controversy. Canva, the web-based design tool, bills itself as way to make graphic design simple and allow those without graphic design experience or know-how to easily make flyers, social media graphics, and even logos. According to Canva CEO and co-founder, Melanie Perkins, the idea behind Canva is to make graphic design accessible to everyone. With trendy templates and typefaces, it makes it easy for amateurs to design content from their phones. Just insert your photo or use stock photos, add text, a filter, and done! You’ve got Instagram-able content! But here’s the thing. Canva makes you a graphic designer the same way a microwave makes you a chef. Sure you can make a decent meal in minutes, but like a TV Dinner, it’s flavorless and bland. It homogenizes design. Everything designed on Canva looks like it was designed on Canva. 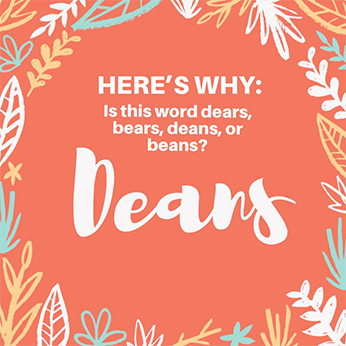 Have you ever seen something that was created on Canva that made you sit up and say “wow?” The content is merely passable and mediocre at best. It’s hotel art, meant to look nice in the room and not offend anyone’s sensibilities…but not really stand out either. I get it, resources are slim. The graphic designers on your staff (If you are lucky enough to have them) are busy with other projects and don’t have time to create graphics for every social media post you make. What is a social media manager to do? Canva seems like a great way to get quality images on your posts quickly and without a lot of graphic design skill. But content produced with Canva isn’t that great. It’s formulaic and identical to what everyone else is doing. In addition, it still requires a working knowledge of basic graphic design principles in order to make something that looks good or to at least avoid some design pitfalls. Design pitfalls are abound for amateur designers in Canva. I don’t want to get too down on Canva. It has its uses. It’s great for student groups promoting their events, adding text to your vacation photos, or for a 6th grade presentation on how a bill becomes a law. But it’s not for professional use. 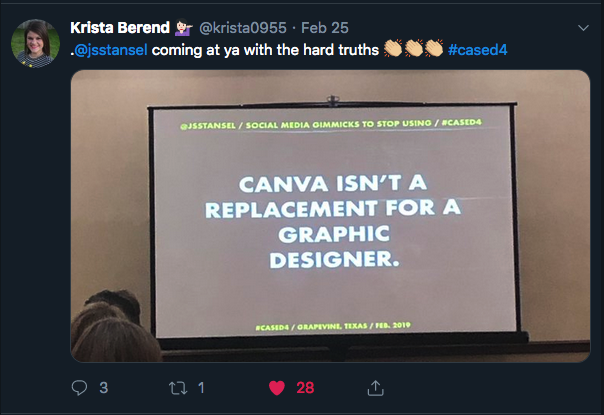 Using Canva templates on university social media cheapens your brand. Sure, it’s quick and easy, but it’s only a slightly better than Microsoft Publisher. Making a post for the English department’s Facebook page about an upcoming speaker series? Okay, maybe. Making a major announcement on the university’s primary social media channels? Absolutely not. Using Canva for primary university channels needs to be the last minute, no other option exception, not the rule. Side note: Canva has logo templates for small businesses. If you are creating a logo for your business in Canva and not hiring a graphic designer for this…well, you’re starting off with a really terrible decision. Canva has more than 4 million users. Those users have seen all the templates that Canva has to offer and they can spot Canva content. They know when your brand uses it. And while non-Canva users might not, they know they’ve seen posts that look a lot like yours before. So, there goes unique brand identity. You’re not fooling anyone. No one thinks your microwave dinner was made from scratch. Worse still, the danger is not that the average consumer will notice that you are using Canva templates, the danger is that they won’t notice your content at all; having been bombarded with so much other similar content, they will just tune yours out. Instead of using Canva, why not try working with your graphic design team to create templates that match your university branding and are simple enough for you to edit and repurpose? Or ask yourself why you need text on images at all? Wouldn’t a striking, well composed photo work just as well if not better? Instead of throwing all the event information on a graphic, why not post it to your website where it is easy to read, searchable, and accessible? There are alternatives. Most importantly, Canva devalues the already extremely under-appreciated work that graphic designers do. As social media managers, we’ve all heard the “Why can’t we just have an intern do it?” questions about our jobs and been justly frustrated by it. We know what can go wrong when you leave social media to amateurs. Our collogues in graphic design experience the same frustration and saying “Why can’t we just use Canva?” exacerbates this. We need to recognize that graphic design is a craft that requires time, education, and experience to master. It’s a skill worth paying for. I’ve had the privilege of working with some incredibly talented designers and learned so much from them. Instead of making Canva your go-to tool for all your design needs, take the time to sit down with a graphic designer to talk about your needs. Chances are, you’ll find a solution that works a lot better than Canva.